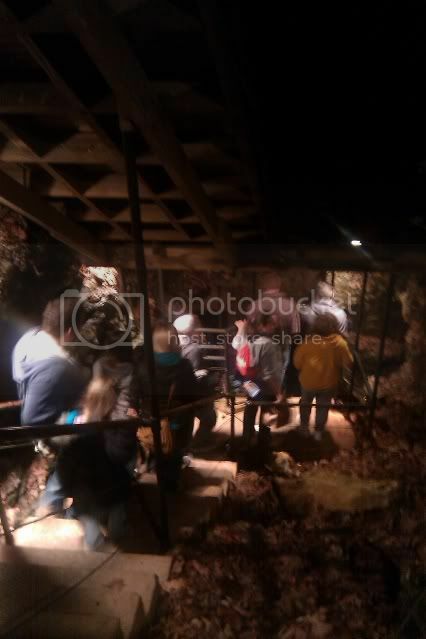 I had at least two posts in mind for Silver Dollar City, but I stupidly left my camera back at the condo and had only my cell phone, no flash, in the dark. Oops. So here is one blurry photo of the halfway point of the descent into Marvel Cave. Halfway to the door, I should say. You can just make out the door right about dead center of the picture. Once inside, you have another couple hundred stairs to the bottom. LOTS AND LOTS OF STAIRS. Also a lot of tight spaces, so the whole one hour tour is like doing some sort of aerobics, with the bobbing and weaving and climbing stairs while hunched over. I thought about saving this for a later trip, when I can get pictures, but I just love to share fun facts and can't save it until summer. 1. Marvel Cave, which is on the Silver Dollar City property and accessed through the Hospitality House, was originally called Marble Cave. Turns out all the "marble" was actually limestone. 2. In the early days as a show cave, you had to descend a 60' ladder and clamber down a huge pile of rocks, with a lit candle. To get out, you used pickaxes to climb back up to the ladder. Don't forget to hang onto the candle, because they don't give you extra matches! 3. Marvel Cave was THE original attraction in this area. It opened in 1894, and the Herschend family bought it in 1950. Silver Dollar City, a mining town themed amusement park, opened in 1960 and was built up around the entrance to the cave. People loved Silver Dollar City so much that it just grew and grew, to the point of, "Oh by the way, we also have a cave." 4. Did you ever hear that women's cosmetics, mascara in particular, contains bat guano? Our tour guide claimed this was made up by a Marvel Cave guide in the 1960s as an explanation for "batting" ones eyes. Fun story, but it's more likely that it's just common confusion. "Guano" sounds very much like "guanine", a color additive that IS used in mascara and is derived from fish scales. There is no poop in any cosmetics, ladies. Guano is/was, however, used in fertilizer and the manufacture of gunpowder. 5. If you're familiar with Missouri show caves, you can probably recite a lot of barn/billboard slogans like "See Jesse James' hideout!" and "60 degrees year round!" Did you know that the "year round" temperature of a cave is the average temperature for the region? We thought all caves are 60 degrees year round, but they're warmer in the south and colder in the north. 6. Which leads to the last factoid: We asked our tour guide if White nose syndrome has arrived at Marvel Cave yet, because they still have a large bat population that you might have to dodge in the summer months. She said there are no confirmed cases in Missouri so far, and that one current theory is that our caves are too warm for the fungus. Good news for the bats of Missouri! I highly recommend checking out Marvel Cave if you go to Silver Dollar City and are up for a moderate physical challenge. It's a beautiful cave, and we'd never be able to do the waterfalls justice even if we'd had the expensive camera. Some things you really must see for yourself! Random Question? Do you remember who your guide was? Over a year later, all I can tell you is that it was a girl with brown hair.